For sales professionals, the answer is probably not what you think. Most salespeople think of success in terms of accomplishments - like winning a major account, reaching sales goals, earning commission bonuses, winning sales awards, or getting promoted. 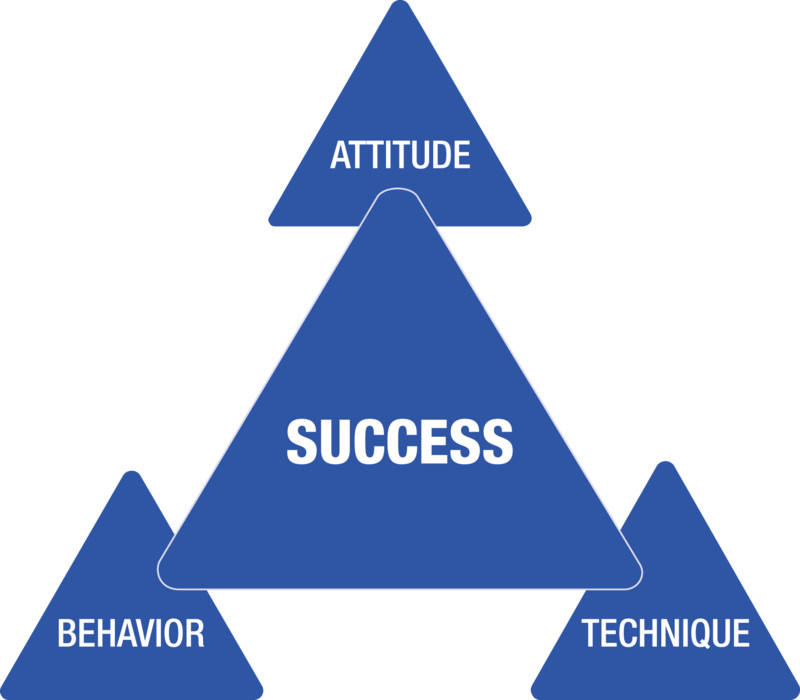 To understand the experience of success -- the process that actually delivers positive results -- we can think of success as a triangle with the core elements of Attitude, Technique, and Behavior each representing one point of the figure. This is the Sandler Success Triangle. Notice that each point of the Success Triangle (in the center of the diagram above) is connected to the other points of the triangle. Those connections provide strength and stability to the structure. Having a positive attitude accomplishes little if it is not channeled into an effectively executed plan. Even the best behavior plans are doomed to failure if they are not backed by a supportive attitude and implemented with the requisite skills. And technique alone won’t accomplish much if it’s not applied to an appropriate framework of daily behavior with a positive expectation of success. Attitude, Technique, and Behavior are the elements necessary for any meaningful, sustainable personal and professional success in any endeavor. This leads to a common question, one we hear from many sales professionals: Which of the three elements should I focus on first? 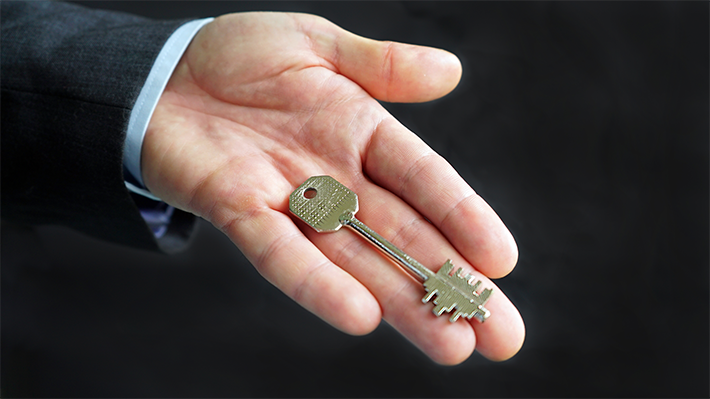 In other words, What is the key to success? We find that salespeople often focus solely or primarily on technique – learning the right things to do and say in a particular situation. On its own, however, technique won’t lead you to success. Experience has shown that focusing on technique, while ignoring the other two points, is not a viable point of entry to the Success Triangle. So where to begin? The answer is actually a simple one: you begin with Behavior. The Sandler Success Triangle is the best roadmap to success, and every roadmap, of course, needs a starting point. Whenever you’re using this roadmap, you’ll want to begin with Behavior—with muscle memory, with action. Behavior—what you repeatedly do—is the perfect starting point on your journey to success. Just by doing the right behavior, you can change your attitude for the better. For example, you may not feel like getting out and jogging around the block when your alarm goes off at five in the morning … but if you suit up, warm up, and start to run, you’ll find that your attitude will eventually adjust to the actions you’ve taken! Of course, your behaviors must always connect to personalized goals. Each of those goals must have your unconditional commitment for achievement; each must connect to a strategy or plan to achieve the goal; and you must confirm the specific action steps necessary to execute the goals. The founder of our company, David Sandler, used to say: “Do the behaviors! Do the behaviors! Do the behaviors!” He emphasized this point because he knew that taking consistent action on a properly trained and reinforced skill is the best way to generate positive momentum toward an important objective. Sandler urged salespeople to begin their journey to success with the powerful cycle of goals, plans, and actions. Begin with your existing strong suit. Start with the critical behaviors you can already do well and can execute from muscle memory. Figure out what you are going to do, and how often you are going to do it. For instance, if you’re comfortable attending networking events and enjoy setting up meetings with prospects that way, start with scheduling those networking meetings. Create an initial behavioral plan and execute it, based on what you already do well. Then analyze your results, and notice which areas still need additional training or reinforcement. If you’ve learned something important (prospecting via LinkedIn, for instance), but have not yet made it part of a repetitive behavior pattern, part of your muscle memory, that’s okay. You already have the technique, the skill - it’s just not yet a behavior. Identify those skills that need repetition and improvement in order to become second nature. Expand your muscle memory! Some salespeople, as we’ve seen, get sidetracked because they put too much emphasis on learning the right technique. Others feel they need to start with attitude, with changing their own outlook and belief system. We always suggest a different priority. Start with behavior! If you try to lead with attitude, with getting your belief system “straightened out,” you will inevitably run into problems. But if you simply do the right behaviors, day after day, your attitude will catch up. Not only that - you’ll be in a much better position to turn the appropriate techniques into new “muscle memory” behaviors that support your goals!